A beautiful Villa/house of character in Zurrieq Malta. This property is full of charm, with a large private pool, terraces, courtyards, garden, mill room. This is a fantastic villa/character home. WiFi enabled. Book Early To Secure Availabilty. A beautiful furnished private holiday villa for rent in Malta with a large pool & extensive grounds. The property has a contemporary finish but was refurbished in local stone to keep the original feel of a local farmhouse. Marsascala holiday villa in Malta for rent with a swimming pool in front of little rocky beach and the open sea. Holiday accommodation for up to 16 persons in 6 Bedrooms. Snooker table and playstation. A TOP CHOICE property. A recently refurbished villa to rent in Zejtun with 2 bedrooms, situated in this picturesque and typical town of Malta. 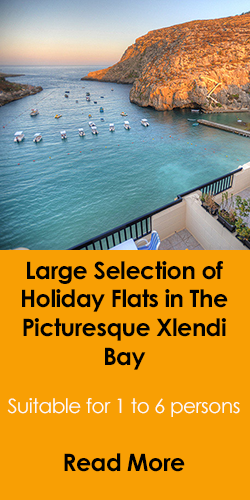 Holiday accommodation for up to 6 persons. Excellent quality and furnishing. Highly recommended. Rural holiday villa rental for short lets in Malta. Accommodation provided for eleven guests in four bedrooms. A good sized swimming pool and deck area. Located in a quiet and laid back village. Highly Recommended. A lovely four bedroom villa rental in a typical Maltese town with a large swimming pool, available for Malta holiday rentals throughout the year. Short lets accommodation for up to 12 persons. Holiday villa rental in Malta. This 5 bedroom villa with private pool and games room just recently re-converted by a meticulous owner who gave every attention to detail. Excellent holiday property in a tranquil setting. An exceptional private fully detached country villa to rent for holidays in Malta, with large swimming pool garden and deck area, luxury furnishing and setting. 3 bedrooms, fully equipped, sauna, free WiFi. This is a top choice property. A unique noble man's home to rent in the beautiful walled city of Mdina, Malta. Sleeps up 6 to 8 persons. Historic attractions nearby. A truely unique opportunity to stay in the silent city of Mdina. HIGHLY RECOMMENDED. SUPER Two bedroom modern villa to rent in St Julian's, Malta within walking distance to all amenities, attractions, the seaside, beach casinos, restaurants and much more. Accommodation provided for six persons. Really WOW!. Have a look at the walk in property video. An artistic, classic and tastefully designed Villa Town House offered for holiday rentals in Malta at excellent rates. Enjoying a lovely swimming pool, garden and all you need for short stays in a typical local village of Malta. 2 minutes walk to a bus stop. Holiday villa with a lovely private swimming pool & drive in. Available for short Malta holiday rentals, situated in Rabat which is a stone throw away from the medieval city of Mdina. 5 bedrooms and a sleeping capacity of up to 12 persons. Highly recommended. A centrally located holiday villa with a private pool in the residential area of Swieqi, St Julians and just a few minutes walk to Paceville and Spinola Bay. Fully equipped for self catering holidays in Malta including a BBQ, outdoor dinning area & 6 car driveway. Exceptional 6 bedroom private Malta Holiday Villa to rent, including a games room, large swimming pool with slide, BBQ, WIFI. 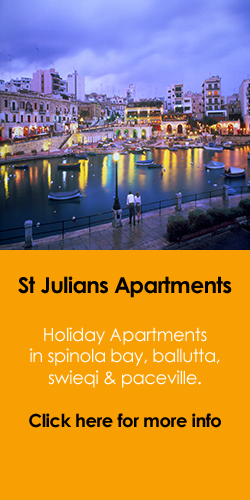 Situated 10 minutes away from St Julians, Sliema & Valletta. An excellent place to stay during your holidays. HIGHLY RECOMMENDED. A lovely holiday villa enjoying 3 large bedrooms with an en suite shower, large arched living room, dining area, a lovely pool with jacuzzi and sun terrace, ideal for al fresco open air dining. Your vacation villa in Zurrieq on the the south west coast of Malta. WOW!! Fully detached elevated bungalow for holiday lettings in Ibragg/St Julians, lounge with fireplace, large living spaces, air-conditioned, games room, mini gym, stove for winter heating, large heated swimming pool, you won't find better. A FANTASTIC PROPERTY. 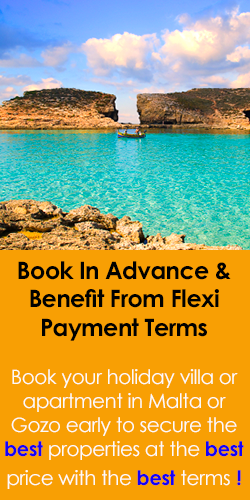 Malta's best kept secret is the secluded countryside in the south & coast where you will find crystal clear sea and quiet nestled farmhouse dwellings. This private holiday villa with lush gardens & a private pool in Marsascala is a sure bet for your holiday in Malta. A fantsactic 17th century Valletta property designed by the french artist Julien Vinet offering Valletta accommodation for up to 11 guests. Each of the 4 bedrooms are decorated with designer furniture. A unique property in the Capital City of Valletta. A TOP CHOICE. A beautiful villa for short lets in Mgarr, Malta. This traditional house of character provides holiday accommodation for up to four persons offering a peaceful setting and tranquility in this traditional village which is just 10 minutes away from Golden Sands beach. Bang on the Seafront - Holiday villa in Marsascala. 4 bedrooms, private swimming pool, accommodation for up to 11 persons. Terrace with direct sea views. Just walk across to the seaside promenade, restaurants, cafes, several places to swim. Four bedroom house of character for short lets in Zejtun. A quaint village that lies in a valley in the souther part of the Island. 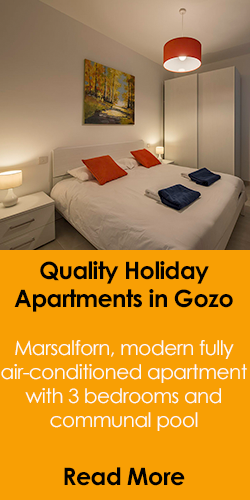 Accommodation is provided for a maximum of seven persons. Fully detached villa for rent in St Julians Ibragg enjoying a large open plan living and dining area, a separate large kitchen with another dining area, 6 air conditioned bedrooms, 3 bathrooms and a jacuzzi. 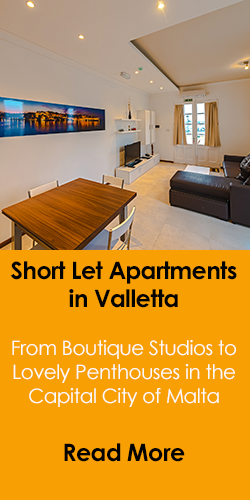 Private villa rentals in central Malta offer accommodation for up to 13 people.. A lovely property with a large pool and sun deck, 3 double bedrooms, 2 twin bedrooms and a further 2 bedrooms (in annex building by the pool). Expertly converted house of character for rentals in Malta, retaining much of its original charm, rich in furnishing, lively colourful plants, wooden beams, authentic Maltese stonework restored after hundreds of years. A Beautiful Holiday Villa for Rent in Malta, ideal for family holidays. This lovely property enjoys 4 bedrooms, a large swimming pool deck & is a short distance away from Golden Bay, Malta's best sandy beach.